I use this as a meal replacement/weight management drink. It’s super nice and quick when you are on the go, and it’s not one of those meal replacement drinks you have to force down. Whenever I make myself one of these, I end up having to make two batches, one for me, and one for my kiddo’s. As you can see my toddler sitting, eagerly awaiting his smoothy 🙂 It is super yummy and keeps you full for hours. Plus, it feel like your letting yourself have a treat when really you are watching what your eating, or in this case drinking. 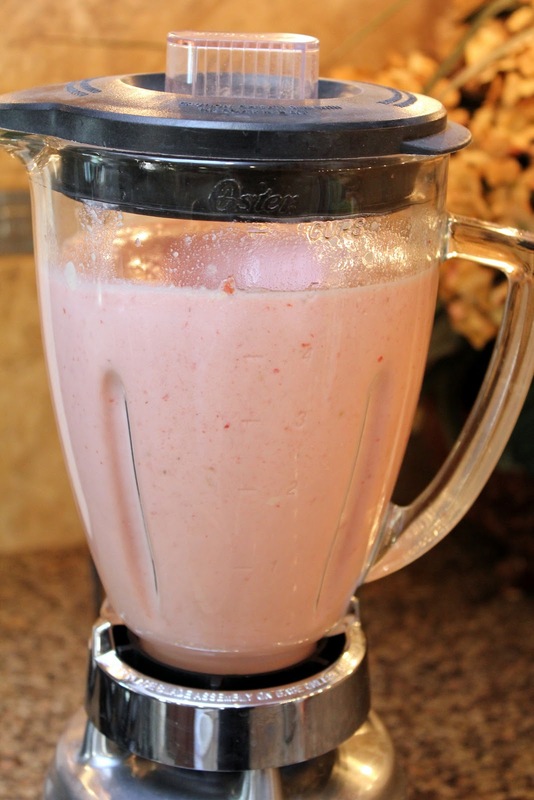 Add banana, strawberries, ice if using fresh strawberries, and protein powder to your blender. Then add your milk, apple juice, and water. Put on the cap and blend until mix is smooth and no clumps remain. To give you a heads up, home made smoothies have a tendency to separate after a little bit, where the foam will float to the top. So you can actually buy cups at health food stores, like High Health or GNC, that are made to mix your drink after you add it. Basically it’s a cup with a lid and a stirring device inside, designed so you can shake your drink to incorporate it. This is what I use when I’m on the go and want to drink my smoothy slowly, but you can use a water bottle too.